It seems that another month is done, as today is the last day for February. How time flies by. 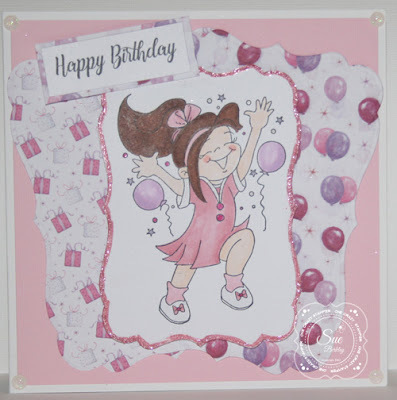 For my post today, I have used the adorable Birthday Bella from this month's High Hopes Stamps release called "Party Time". I used the Nuvo Adhesive pen to add some glue around the edge of the die cut. Nuvo Rose Quartz Sparkle Dust was then added. The Sparkle Dust glitter is a fine glitter, which has a smooth, satiny texture to it. As today is the last day of the month, this means that tomorrow will be the start of a brand new challenge. Do make some time to stop by for a visit and see what the OCS Divas have been busy creating. 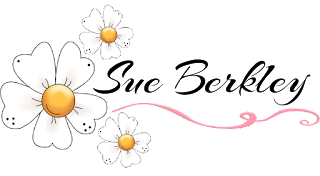 Welcome and so glad you are back checking to see what I am sharing today for the challenge that is happening here at One Crazy Stamper. 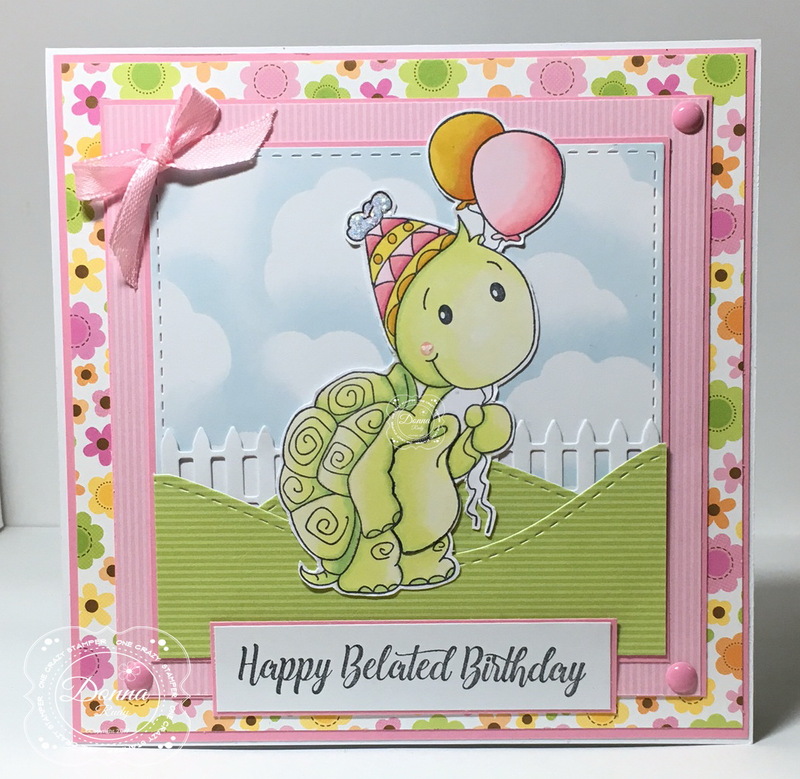 My card today, I am sharing this cute stamp from the new release High Hopes Rubber Stamps has out now. Yertle Turtle makes for a fun boy card, I colored it using my copic markers and distressed the edges of the pattern paper from My Mind's Eye, and card stock. I used the Oops! stamp and the Sorry I missed it stamp as well from High Hopes Rubber Stamps. I used the above sketch that is an optional to the challenge, but it so much fun using it. I hope you can stop by Lora's store and check out these stamps along with other supplies. Play along with the design team and lets get our craft groove on. Cheers! Card Stock, MME pattern paper, copic markers, memento black ink, distressing tool, HH Stamps-Yertle Turtle Birthday, Sorry I missed it, Oops. It's Nat and I'm back again to share a very kitten-y creation today. 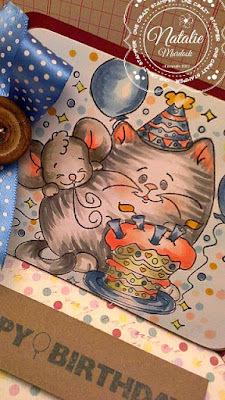 Cat and Mouse Party found here! 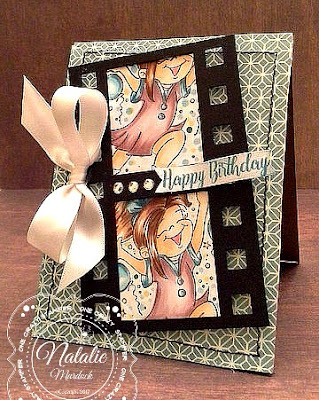 Happy Birthday Block found here! The image is coloured with Copic markers, some fun polka dotted ribbon and added dimensional foam dots to the back of my sentiment. 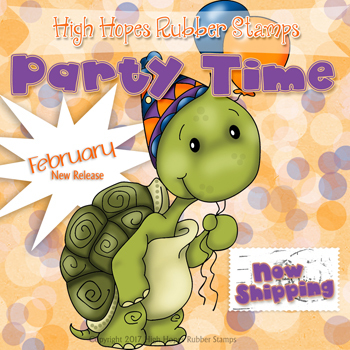 I hope you are enjoying our month of new release stamps from High Hopes celebrating birthdays! My card this week features the new release "Bandit's Cake" and the "Eat Cake" sentiment. I don't know about you but sometimes a gals just gotta eat cake! and I know my dog likes to have a Birthday party too - whether it's his Birthday or not - he just wants cake! Okay he loves banana muffins but to him it's cake! I coloured our oh so cute Bandit in pug colours and cut him out using a stitched square die. I added some colour to his eyes by drawing a light pencil line inside the edge and then colouring the pupil and then added some colour. 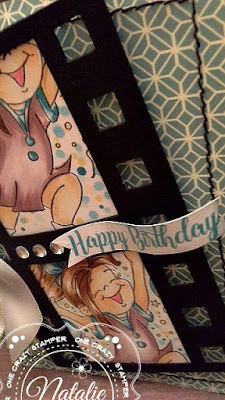 My patterned paper is from my stash but I wanted more of a party feel to it so I used a mini confetti stamp to add some party feel fun. 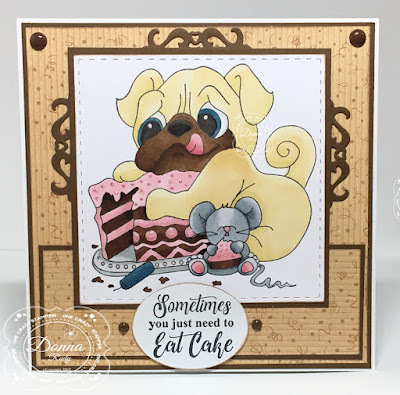 The sentiment was stamped and cut using a classic oval die and all the paper,sentiment and image were inked on edges with matching ink. I added some edges by die cutting some resplendent rectangles and cutting the decorative end off of them. 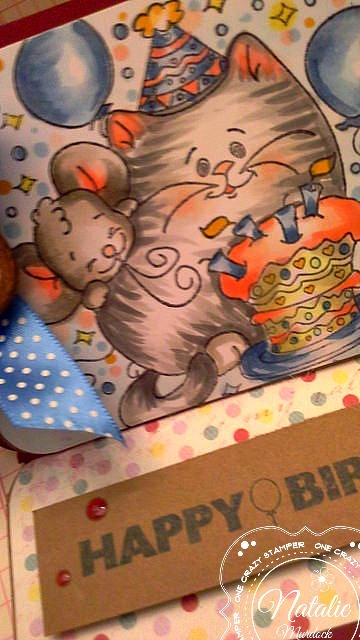 Some gumdrops and Star Dust Stickles added to the icing for sparkly sprinkles finish off my card. Welcome back, OCS fans. I hope you have enjoyed yesterday's Family Day holiday and spent some time with your loved ones. For my card today, I have used Charlie Party Cow, from High Hopes Stamps new "Party Time" release, which debut this month. Nuvo Glitter Drops (White Blizzard) were used on the balloons and Strawberry Coulis Nuvo Jewel Drops were used in the corners. There is still plenty of time to enter this month's challenge for a chance to win 2 unmounted High Hopes Stamps of your choice. For any supplies that you might need and to see all the new products that constantly arriving, check out Lora's OCS store. Thanks for stopping, my turn to host today's challenge here at One Crazy Stamper and my card was super fun to create. First off using the fun sketch below. Then the new release from High Hopes Rubber Stamps is always fun coloring and creating. I hope you can be creative today and play along with this challenge. 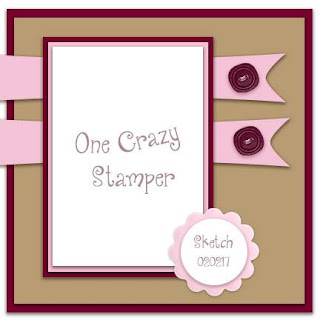 For more details One Crazy Stamper and for supplies stop by Lora's store. Till next time, Happy Crafting. Copic Markers, Foam Tape, Craftin Desert Diva Dies. Happy Birthday to you .....Happy Birthday to you!! High Hopes Stamps! Birthday Bella can be found here! The image was stamped twice and trimmed down to fit inside the film strip. This gal was coloured with Copic markers a confetti background was created for some festive fun! A crisp white satin bow, sewing stitches, some diamond gems and a birth wish were added too! Welcome back OCS fans! Happy Wednesday! I am having way too much fun playing with the new Party Time release from High Hopes Rubber Stamps. 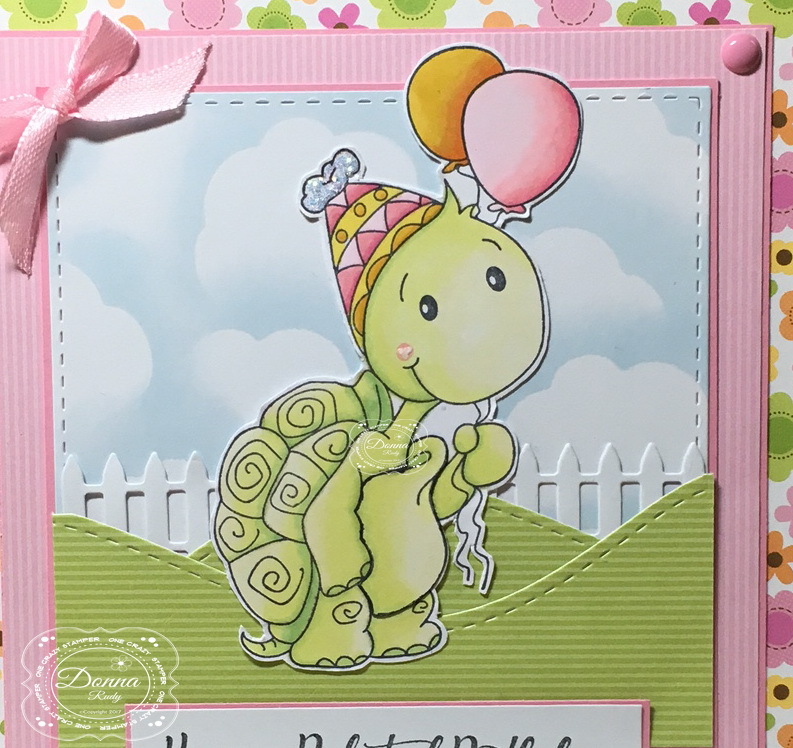 This week I am playing with "Yertle Turtle Birthday" - I LOVE his name - and the "Belated Birthday" sentiment. Poor Yertle, he is a turtle and moves VERY slowly so he missed the Birthday party. He looks a little sheepish about missing the party but also very happy to bring belated wishes. After colouring my stamp with alcohol markers I fussy cut it with my trusty manicure scissors, added some Stickles and a clear sparkle pen for some bling and set it aside to dry. While my image was drying, I cut a piece of white cardstock and a cloud die, grabbed some light blue ink and a dauber and created my sky background. A picket fence and some grass hills finish off my background scene for Yertle. 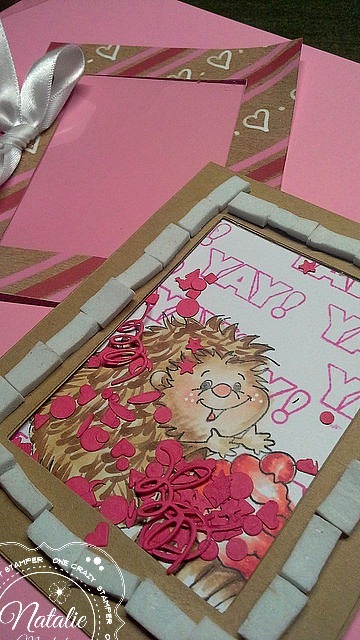 Patterned paper pieces and cardstock were cut to size to fit my 5.5" x 5.5" base and everything was glued down. The sentiment was stamped and mounted, a ribbon bow added and some enamel dots to finish off my card. 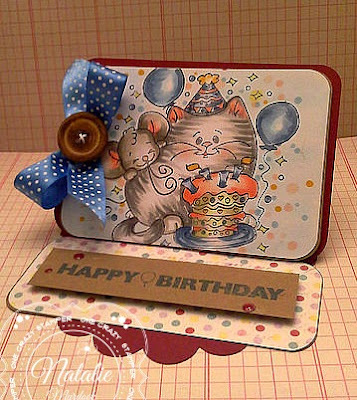 I'm back again with another adorable stamp called Cat & Mouse Party, from High Hopes Rubber Stamps' latest release called "Party Time". Atyou Spica Glitter Pens were used to add colour to the confetti around the image, and the circles around the sentiment. Nuvo Glitter & Jewel Drops were used on the balloons. Sakura Gelly Roll Pens were used to colour It's Party Time. 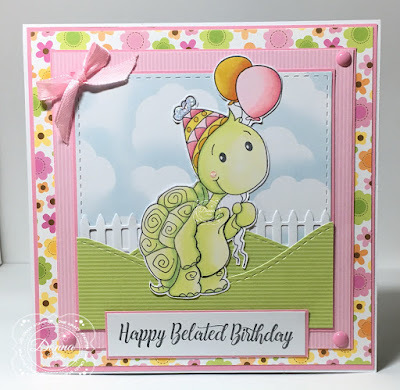 Do stop by and play along with this month's challenge for a chance to win 2 unmounted High Hopes Stamps of your choice. If you need any supplies to complete your project stop by Lora's OCS store to see what new products have arrived. Hello and welcome back, hope you are having a wonderful day. Our challenge that is going on here at One Crazy Stamper is so fun, and the design team has created wonderful projects. Do hope you can share your cards and say hello. 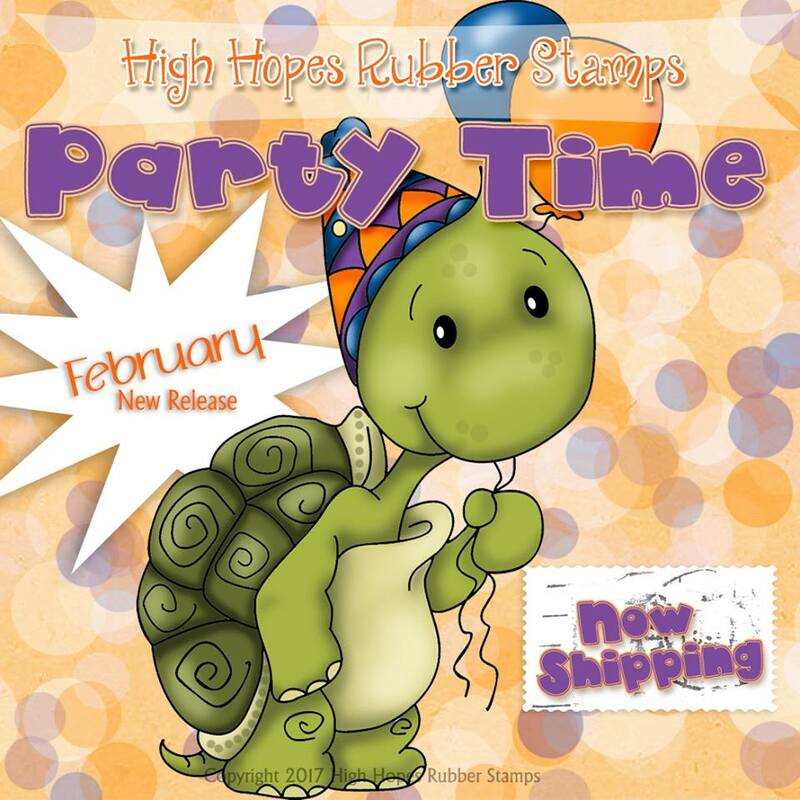 This is a new release from High Hopes Rubber Stamps to share with you. My card today started off with this fun sketch, which is part of the challenge as an option, but why wouldn't you want to try this, it is so cool. I hope you can get into your craft room today, and have some fun. Till next time, happy crafting and remember to stop by Lora's store for supplies as well. Photo Play-Plaid Paper, Scallop Circle Dies, Circle Dies. 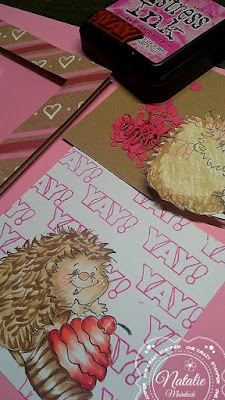 It's Birthday Time over on the One Crazy Stamper's website this month and I am so happy to share my hedgy birthday card today. This cutie is so darn thrilled over the cupcake. Totally love him to bits!! Happy Birthday from High Hopes found here! I started off creating this card by colouring the image with Copic Markers. 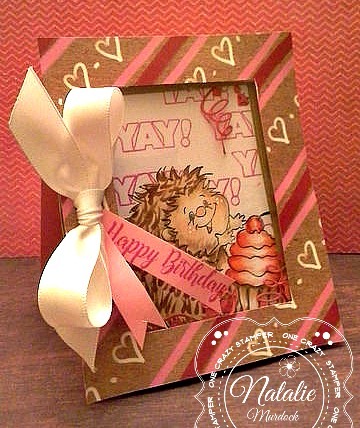 The image was then masked and and the background stamped with the Yay sentiment. 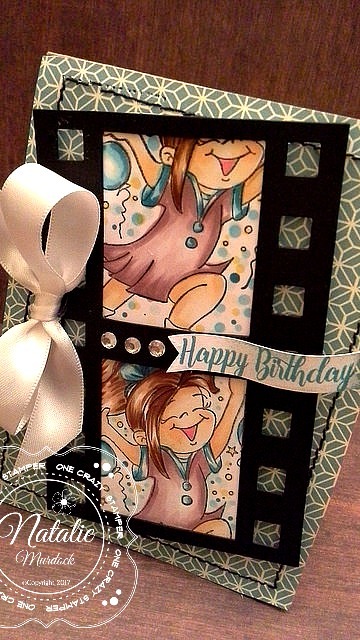 Added confetti to create a shaker type card and a foam dot border to help the confetti stay in place. I used a transparency for the window of the shaker that was glued to the foam. 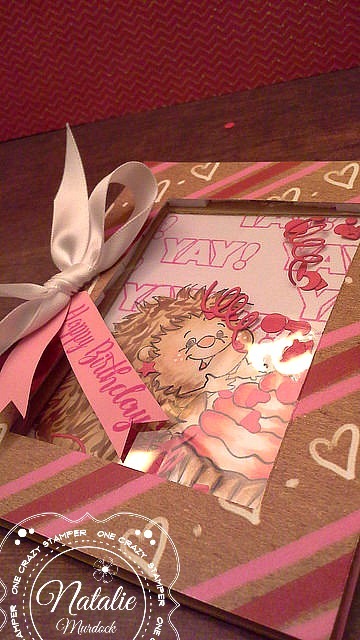 Next the top frame was glued into place and an added bow and birthday sentiment. 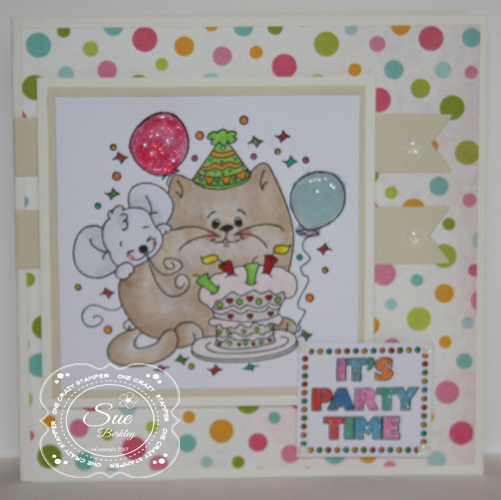 Myra Webb our Guest Designer for this month is back with another card from this month's HH Release called "Party Time". More details can be found on Myra's blog. By now you must be wondering whether I am an animal lover? Of course! That's why today I get to share another High Hopes stamp! 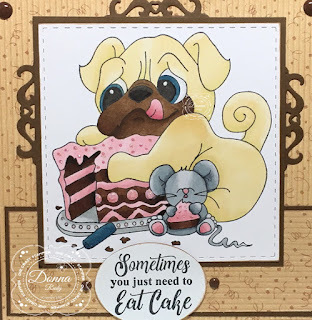 The birthday Chihuahua - "Chi Chi's Party", is available at One Crazy Stamper and High Hopes Stamps! To color this I used Tim Holtz Distress crayons. I am just learning all the fabulous ways to use this product. This was my first attempt. I colored this card using watercolor paper. The crayons offered an interesting effect. I have since learned there are so many more options on how to use this product you will be sure to see more! 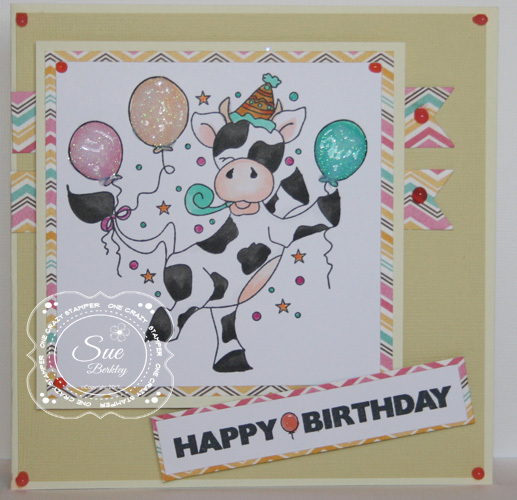 Celebrate with Charlie, the Party Cow! !